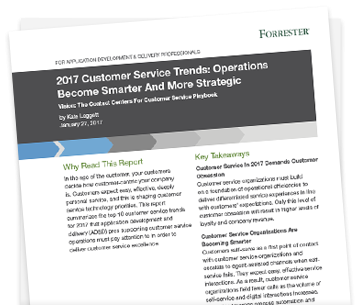 In this report, Forrester advises brands on 10 key trends for 2017 that will influence and enhance the customer service experience; ultimately, helping to impact top-line revenue. The report details driving factors for why customer service organizations are getting smaller, smarter and more strategic. Customer service demands customer obsession. Deliver differentiated customer service experiences that align with customer expectations. Customer service becomes smarter. Empower customers to self-serve first, and use digital and automated processes to drive customer satisfaction. Customer service becomes more strategic. Use the right methods at the right time to build emotional bonds and strong relationships with customers.